I had a fantastic time at the Chipping Norton Literary Festival (known affectionately as Chipping Lit Fest) at the weekend. I led a workshop on ‘Writing Hot Scenes’ in a room above the Jaffe & Neale Bookshop & Cafe where I was treated to chocolate brownie and rooibos tea on arrival and cioccolata torte and rooibos tea on departure. With two slices of cioccolata torte to take home … (Are you beginning to see why I had a good time?) My thanks to Polly Jaffe for being so generous and hospitable. The workshop went well, with lots of hilarity as well as work from the lovely participants. Thanks to you all for attending. In fact, you made it go so well that I’m now running a similar workshop at the Romantic Novelists’ Association’s conference July 12-14. Then I was fetched by a nice lady named Susie to take part in a video interview on the balcony of the pub next door. Cue buying me a drink as we passed the bar and sitting me down to lunch with the film crew. I’d been put up at a lovely hotel, enjoyed a gorgeous dinner on the evening before, and met Richard Dawkins in the Green Room. The sun had been shining all weekend and I was sorry that I had to leave. But Formula 1 was on the TV. On Monday I’m flying out to Kansas City on Monday to the massive and influential RT Booklovers Convention, the thirtieth year of this annual event that welcomes readers and writers of romantic fiction from all over the world. I’ll be appearing on three panels, signing at the Giant Book Fair, giving a radio interview, meeting readers and attending a mind-boggling array of parties and events. One of them is a ball. I also have a red cowboy hat with sequins for ‘Rosie Gulch’s Gals’ party and blue/black feathers for my hair for a paranormal party, where I’ll be going as the Witch of Middledip. 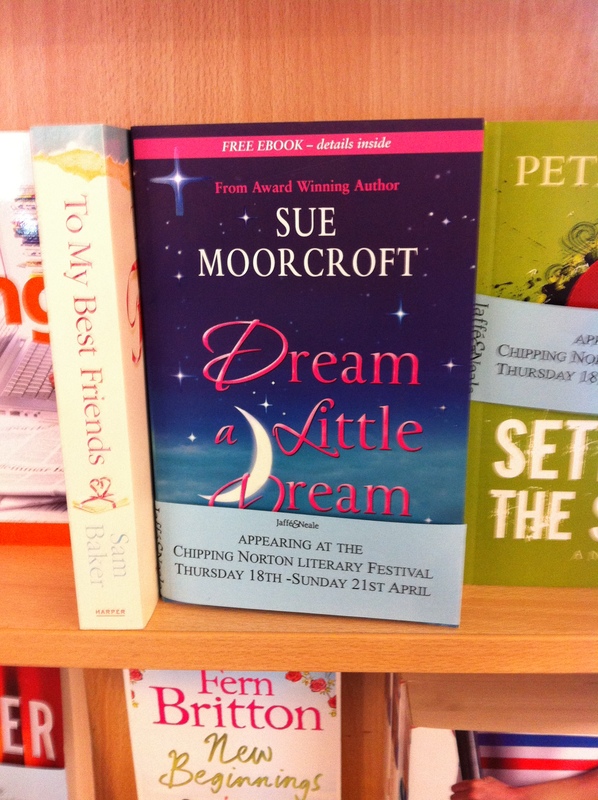 Sue, Chipping Norton is my local literary festival and I couldn’t believe my stupidity when I booked something else for the same weekend so I couldn’t go this year!! Sounds like it was great fun. I really think you need to post some pics of you in the cowboy (girl?) hat. Will you post details of your RNA workshop as I would love to sign up for that. Would I have to be a member of the RNA to attend? The RNA workshop is at the conference and no, you don’t have to be a member to attend. However, there’s a small premium for non-members. If you go to the RNA website Events page [http://www.romanticnovelistsassociation.org/index.php/activities] you can download the Conference Booking Form, which gives you a lot of detail. It’s possible to attend as a day visitor if you don’t wish to be there for the entire weekend. There’s an email contact for the conference organiser, Jan Jones, and she will answer your queries. Go for it! There will be a great programme, I’m certain. Have a wonderful time, Sue. Photos afterwards, please! I’d really love to be a part of group where I can get advice from other experienced people that share the same interest. If you have any recommendations, please let me know. Thanks! I don’t have personal experience but if you’re writing erotica then you might find signposts to forums at Xcite Press. They’re one of the UK’s big publishers of erotica right now.